The best memories growing up where Sunday dinners at my Grandma’s house because she would make the most amazing meals and dessert. 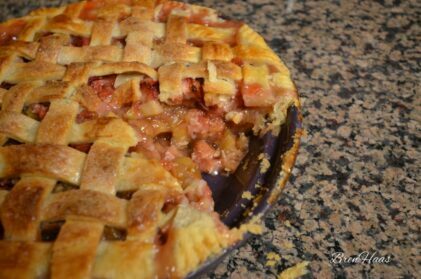 In today’s post, I share Grandma’s Rhubarb Strawberry Pie Recipe for you to print and add to your recipe collection. 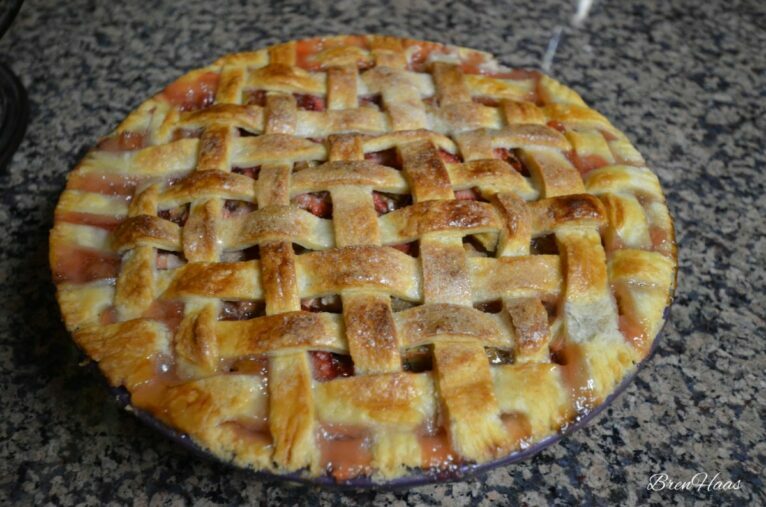 In the Midwest, it just isn’t Spring until that first harvest of strawberries is complete to add to the rhubarb garden fresh. This recipe is super simple and a memory your family will love and carry on for generations. * Store bought crust can be used but it just isn't the same! In a large bowl, mix flour and sugar. Add strawberries and chopped rhubarb. Toss with sugar and flour and let stand for 30 minutes while making homemade crust. BLEND flour and salt in large bowl. Cut shortening into flour mixture using pastry blender or fork. Stir in just enough water with fork until dough holds together. Shape dough into 2 balls. Flatten balls into 1/2-inch thick round disk using rolling pin and lightly floured. Roll dough from center outward into a circle 2-inches wider than pie plate on lightly floured surface for the bottom crust. Transfer dough to pie plate. Second dough ball should be rolled out. Pour filling into pie crust. Dot top with butter, and cover with top crust as lattice or flat circle. Seal edges of top and bottom crust with water. Bake at 400 degrees F for 35 to 40 minutes, or until bubbly and brown. Cool before serving with favorite vanilla ice cream. 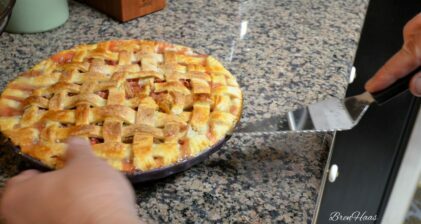 Below are a few of my favorite photos from the kitchen while serving up this amazing pie. Sticky and Sweet – Pie! 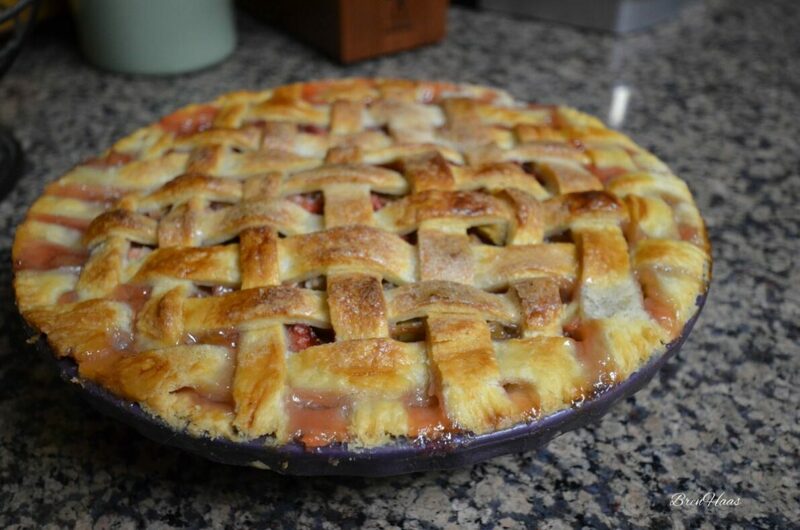 Be sure to use the fresh and the BEST Rhubarb for your homemade pie. 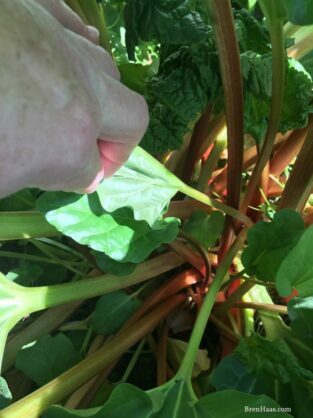 The stalks of the rhubarb plant can be sliced and frozen to use at a later time. Not sure what this variety of Rhubarb is that my husband transplanted from the old Haas Homestead. It is rumored that Grandma Janet Haas dug it up from the ditch and moved it behind the utility room garden where it has been growing since the 1950’s. One thing for sure my husband is super proud of his rhubarb that he was able to save seeds from and start more plants to share. 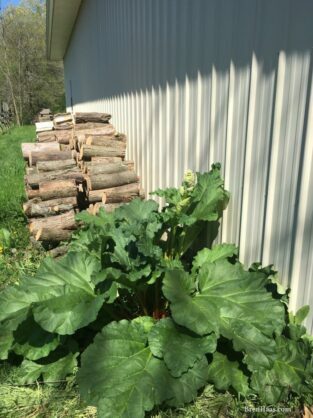 Below are photos of the rhubarb he transplanted and now grows behind our barn on the south side. 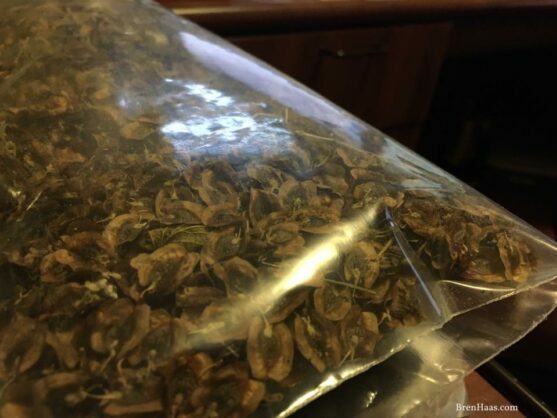 I would love to hear from you so please comment below to tell me what you thought of this recipe and if you used it. I would also like to invite you to visit my contact page to send me additional information.